There's a new charcoal on the US market which comes to us from the Balkan region of Southeastern Europe. To be specific, it comes from Bosnia, Serbia and Montenegro. (Mystery fans will recognize Montenegro as the boyhood home of Rex Stout's famous detective, Nero Wolfe.) As is our custom when charcoal comes from distant lands, we conveniently provide you with a map at right to help orient you. The charcoal is made from sustainably harvested European Beechwood forests, carbonized by local people in small batch kilns, sent to Serbia where it is bulk packed and then shipped to the US for final inspection and packaging. 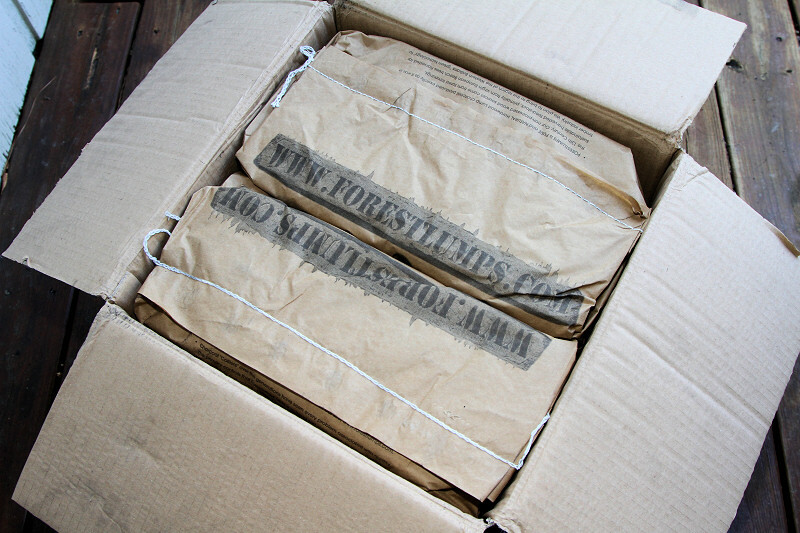 Forestlumps places a lot of emphasis on inspection and quality control to ensure that only beechwood feedstock is used for the charcoal, no scrap enters the supply chain, and that fines are screened out and the charcoal properly packaged and handled to ensure that what you get when buy a box is in top condition. So let's see what this charcoal is like. 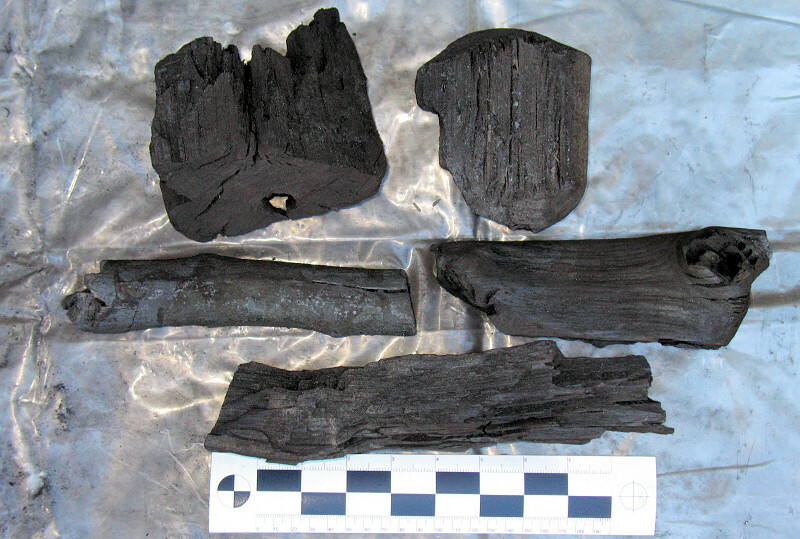 First off, as you can see from the photos below, the charcoal comes in 10-pound bags, two bags per cardboard box. We've obviously seen charcoal in bags before, and we've seen charcoal in boxes before, but this is the first time we've seen the charcoal in bags inside boxes. We've always liked the idea of boxes for protecting the charcoal and ease of stacking. However, pouring charcoal out of a box can be a bit awkward, having to manage the four flaps while pouring. So here you have the protection of the box and the convenience of pouring the charcoal out of a 10-pound bag. As you can see the total contents of the box came in at 19.0 pounds. 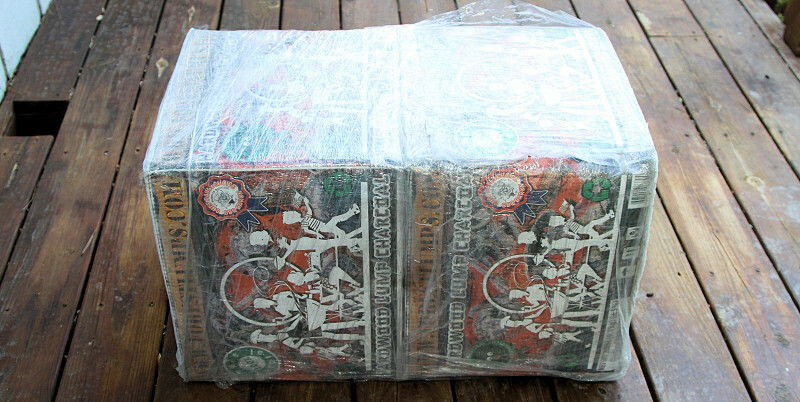 We weighed the contents of the second box we had and found it contained 19.2 pounds. While this does come within the labeled weight of 20 pounds ±5%, we asked the manufacturer about this. The packaging has been redesigned and the boxes are now larger, holding 8% more charcoal. So new boxes will contain at least 20.5 pounds. Otherwise, the size distribution was quite good and the 8.8% chips and dust was low compared to other charcoals. In our lighting test, Forestlumps did very well indeed. It took only 2 sheets of newspaper in our chimney starter to get this charcoal going. When we used a MAPP torch to light the charcoal for the burntime test, it lit easily and spread rapidly. There was no sparking or popping while the charcoal was started in the chimney and the smell of the smoke is very pleasant, perhaps reminiscent of the wonderful smell of Maple Leaf charcoal, which contains (among other woods) beech from Canada. Of course, 2 sheets of newspaper is very low compared to other charcoals. In our maximum temperature test, Forestlumps burned at 970 degrees. This is not the hottest we've ever seen but still is very high compared to all charcoals we have tested. And during the maximum temperature test, we could tell the fire spread very rapidly. Also there was no sparking and popping, either while the fire was coming up to temperature or while the charcoal was roaring away. We mentioned how we use a MAPP torch to start the fire for our burntest. There was very little sparking and popping under the flame of a MAPP torch. Enough that you need to be careful but about as low as we've seen. Of course, when using any type of torch to start lump charcoal, exercise care to avoid injury from sparks and flying embers. In our burn time test, Forestlumps' burn time was high compared to other charcoals, and the ash production was very low compared to all other charcoals we've tested. We will note that the ash produced is quite fine and light and is prone to blowing around if you use a device like a BBQ Guru or perhaps stir up the coals when they are covered with ash. Let things get stable and then don't disturb the fire to avoid having much ash float about. We noted above that the smoke has a moderate and pleasant smell. When the charcoal is first burning, it does produce quite a bit of smoke. We cooked some chicken breast slices and the taste is very pleasant. If you are starting up a new load of this charcoal, you might wish to forego adding any smoking wood since you get a lot of flavor from the charcoal itself. 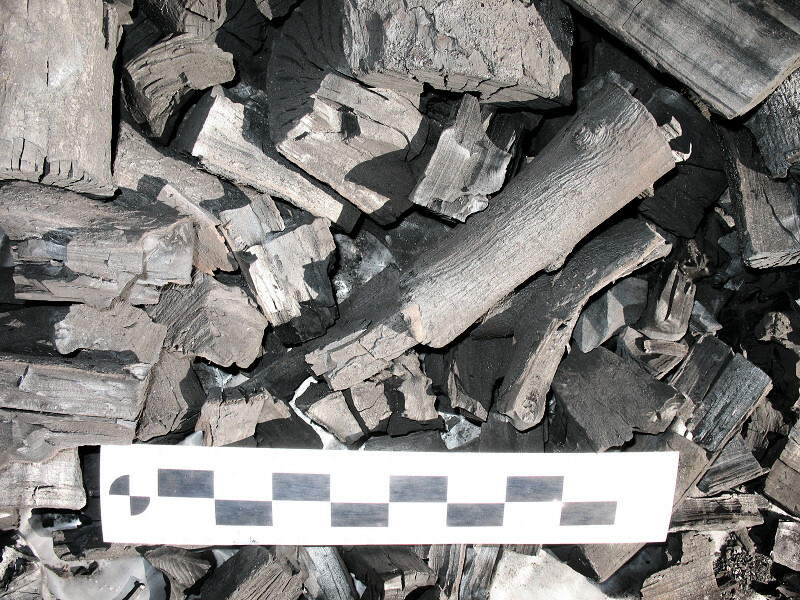 And finally, a bit more about how easy this charcoal is to light and how rapidly the fire spreads. You could almost use chunks of this lump as starter cubes; that is how easy it is to light. The fire spreads very rapidly given adequate airflow. This showed up in our burn time test. We do this test on a small Big Green Egg cooker. We use a BBQ Guru controller to keep the fire at 400° during the test. We leave the damper on the blower wide open, the dual function metal top slider is closed and the holes in the slider are open all the way. With this charcoal, we had to close the holes on the slider about half way because the fire could get above 400° and stay there if we didn't restrict the air a bit. We've never had to do this before, so if you use this lump, you will probably find that you need to get a bit more conservative on your vent settings. So all in all, we really like this charcoal and look forward to burning the rest of it. We give Forestlumps charcoal our Highly Recommended rating. 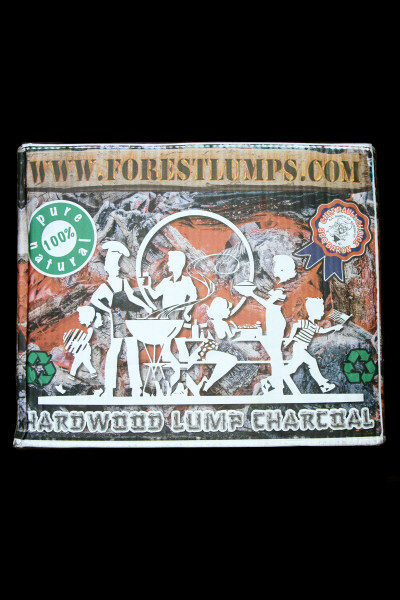 FORESTLUMPS is PURE and NATURAL Hardwood Lump charcoal produced exactly as it was in the 13th Century. Our non-processed wood sources come from forest trimmings, sustainable harvested feed-stock, primarily from virgin European Beech trees harvested for timber industry. We plan to bring to this region of the Western Balkans "green technology" to further advance our quality controlled carbonization. Visit our site, www.forestlumps.com. Charcoal "Colliers" over the generations have seen every problem associated with quality. The primary controls that Forestlumps uses is to hand sort every batch to insure that we only pack fully carbonized charcoal. Furthermore, we sift all charcoal (reducing fines) before packing in Boxed-Bags, which ensures you, our customer, "That Forestlumps is a charcoal worth the price paid." We package and ship this premium Hardwood Lump Charcoal from Central Europe, bringing to the US Market a product not often found in near perfect condition. Every pallet is shipped in containers and protected against moisture, the transit stress, wear and tear that so often ruins hardwood lump charcoal. With all our efforts we still must make the allowance of (±5%) in weight. This is due to the hydroscopic nature of charcoal (extremely absorbent) and the tendency to take on moisture/weight. So, we pack at the factory charcoal which is in the moisture range of (4-12%), every Boxed-Bags are filled with an excess of 0.5kg. If the charcoal looses moisture in transit or gains moisture in transit, only mother nature can say. We try to deliver over the 20 lbs, in hopes that our product will earn respect from our "valued customers." "Lighting Instructions - Use charcoal chimney with 2 sheets of paper and take precautions - Protect eyes and face if MAPP torch is used, sparking may occur. Please do not use lighter fluid as this is an organic product. " This is how the bags arrived. This is how the two bags are packed into each box. We found this piece of plastic string in one bag.